Fifty years ago, a graduate student named Walter Pitman ’67GSAS made a discovery that would change the way we see our planet. It was late at night, and Pitman was reviewing charts of ship data that had just come off the computer at what was then Columbia University’s Lamont Geological Observatory. The ship, the Eltanin, had crossed a mid-ocean ridge—part of a 40,000-mile undersea volcanic mountain chain that encircles the Earth—while recording the magnetic alignment of the rocks in the seafloor below. Pitman suddenly saw symmetry in those recorded lines, with the mid-ocean ridge as the center point. “It was like being struck by lightning,” he said. That symmetry was the smoking gun that confirmed the theory of seafloor spreading and set the stage for our understanding today of plate tectonics. At the time, however, these were highly debated theories. Many people believed that the Earth’s crust was fixed in place. The idea that the continents moved first drew attention in 1912 when German geophysicist Alfred Wegener presented his theory of continental drift. He had been curious as to why the east coast of South America appeared to fit perfectly into the west coast of Africa, like a puzzle. Fossil evidence supported the idea that the continents had somehow been connected at one time. Wegener suggested that the continents—made of less dense silicate rock than the largely basaltic seafloor—drifted through the seafloor, pushing up mountain chains like the Andes as they moved. Half a century later, new research was setting the stage for a better understanding of the planet. Lamont’s Marie Tharp and Bruce Heezen ’57GSAS were developing on the first map of the entire ocean floor, clearly showing the mid-ocean ridges. Scientists had also started to document reversals of Earth’s magnetic field across geologic time, which would become critical to understanding continental drift. In the lava that forms at mid-ocean ridges, iron minerals act like tiny compasses, aligning with the current magnetic field. When the lava cools, it encodes the magnetic field at that time. When the Eltanin crossed the Pacific-Antarctic Ridge, it was towing a magnetometer that captured the magnetic reversals in the rocks below, essentially marking time through the millennia. Back on the Lamont campus, the magnetometer data was fed into a computer to create magnetic profiles of the seafloor. Pitman spread out the Eltanin 19 profile on a desk and was stunned by what he saw. The profile showed clear symmetry of the magnetic reversals on either side of the mid-ocean ridge, suggesting that the volcanic seafloor on either side was being formed at the same time. That profile—and reviews of many others from mid-ocean ridges around the world—confirmed a theory proposed by geologist Harry Hess in 1960 that seafloor formed from lava at the mid-ocean ridges and spread outward from there. British geophysicists Frederick Vine and Drummond Matthews had suggested magnetic stripes might prove the theory, and this was the clear evidence. The Eltanin 19 Profile: The top line shows the magnetic anomalies west to east. The middle line is the reverse, showing the magnetic anomalies east to west, revealing the symmetry. The bottom line is a model for the magnetic anomaly pattern that would be measured over seafloor according to the history of magnetic reversals, indicated by the black and white boxes beneath. From Pitman and Heirtzler, 1966. The night Pitman discovered that “magic magnetic profile,” he pinned it to geologist Neil Opdyke’s door and went home to get some sleep. As soon as Opdyke ’55CC saw it the next morning, he knew what they had. As the scientists tell it, he called Pitman and ordered him in rather colorful terms to get back to the office immediately. The discovery set off on a frenzy of work on data and related theories across the Lamont campus. “The Observatory just erupted,” Pitman said. Lamont had a strict policy of daily sampling and data collection on all its ships, and the campus had amassed a large, computerized library of ocean and seafloor data. “When seafloor spreading erupted on the scene, we had the data,” Pitman said. “We could go to the computer right then and there and say, let’s look at the Pacific Ocean.” They found symmetry around the mid-ocean ridge in magnetic profile after magnetic profile. Lynn Sykes ’65GSAS, a seismologist who had just finished his PhD at Lamont, had been studying the rugged faults along mid-ocean ridges that Canadian geophysicist J. Tuzo Wilson had defined as transform faults and had theorized were connected with seafloor spreading. Pitman recalled that when he showed Sykes the Eltanin 19 profile, Sykes ran to his office, where he had been using seismic data to explore the pattern of first motions from earthquakes along these faults. Sykes’ data—backed up by the new Eltanin profile – showed that the seafloor was actually pulling apart. “Once I had these mechanisms, I knew I had something big,” Sykes said. The data confirmed Wilson’s theories, adding to the growing understanding of seafloor spreading. In Lamont’s Core Lab, a graduate student named Billy Glass ’68GSAS began looking at sediment cores in a new way and had another eureka moment. In testing the remanent directions of magnetized iron minerals in the ancient sediment in the cores, Glass was able to show how the cores also recorded magnetic reversals. “The same pattern that had come out of the seafloor was right there in the sediment cores. So if we knew the ages of when the field reversed, we had a new dating technique for all of the sediment cores,” said Lamont oceanographer Bill Ryan, who was also a Ph.D. student at the time and involved in the work. On April 20, 1966, Pitman, who was still working on his PhD, and his advisor James Heirtzler presented the Eltanin 19 profile at the Annual Meeting of the American Geophysical Union. The scientists still heard skepticism in the halls, but it didn’t last long. In December 1966, Pitman and Heirtzler published their paper, and by the 1967 American Geophysical Union meeting the following spring, the scientific community had moved on from questioning the theory to opening the door to an entirely new direction of study known as plate tectonics. It was a classic paradigm shift that opened an entirely new area of testable assumptions. Over the following years, Lamont scientists and others were able to explain several processes and mechanisms of seafloor spreading and continental drift, including estimating the thickness of tectonic plates and describing subduction zones, where the oldest seafloor dives under the edge of a neighboring plate and back into the hot, flowing interior of the Earth. In 1968, Bryan Isacks ’58CC, ’65GSAS, Jack Oliver ’45CC, ’53GSAS, and Sykes published a paper laying out their ideas for a mobile lithosphere, incorporating ideas from Lamont colleague Xavier Le Pichon, and detailing the process of subduction at island arcs and earthquake mechanisms along the rift system, including recent earthquake swarms at the ridges. “The similarity of the earthquake mechanisms along nearly the entire length of the ridge system suggests that transform faulting and spreading have been occurring in these regions for extended, but as yet unspecified, periods of time,” the scientists wrote. They examined a wide variety of seismic evidence from around the world for any conflicts with the “new global tectonics” and wrote that they found no major obstacles. Plate tectonics is still central to Lamont-Doherty Earth Observatory’s work today, with scientists exploring mid-ocean ridge volcanism, and earthquakes and continent-building at subduction zones, among other fundamental processes. Pitman likes to tell the story of an important confirmation of his analysis of the Eltanin 19 profile. The Deep Sea Scientific Drilling Project was getting started in 1968, and soon scientists aboard the Glomar Challenger were taking sediment core samples—including at five locations where Pitman and Heirtzler had estimated the ages of the seafloor using the Eltanin 19 profile. By examining tiny microfossils in the sediment, the scientists could determine the age of the first ooze that had covered newly erupted lava. 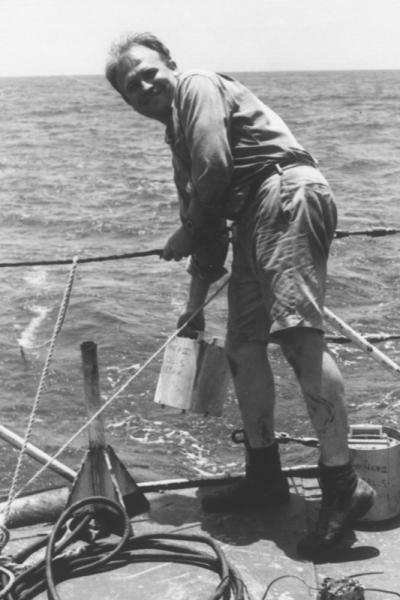 Art Maxwell, co-chief scientist aboard the Glomar Challenger, radioed over to Pitman, who was aboard Lamont’s three-masted research schooner, the Vema, a few miles away. He had some news, but he wanted to share it with Pitman in person. They arranged a rendezvous, and Pitman went over in a lifeboat bringing along a bottle of whiskey—which he exchanged for a case of steak. The news: The ages from the seafloor sediment cores had confirmed Pitman’s predictions. On May 23-24, scientists involved in Lamont’s early discoveries around plate tectonics will be holding a symposium to mark the 50th anniversary of the discoveries that led to the confirmation of plate tectonics and new research underway today.